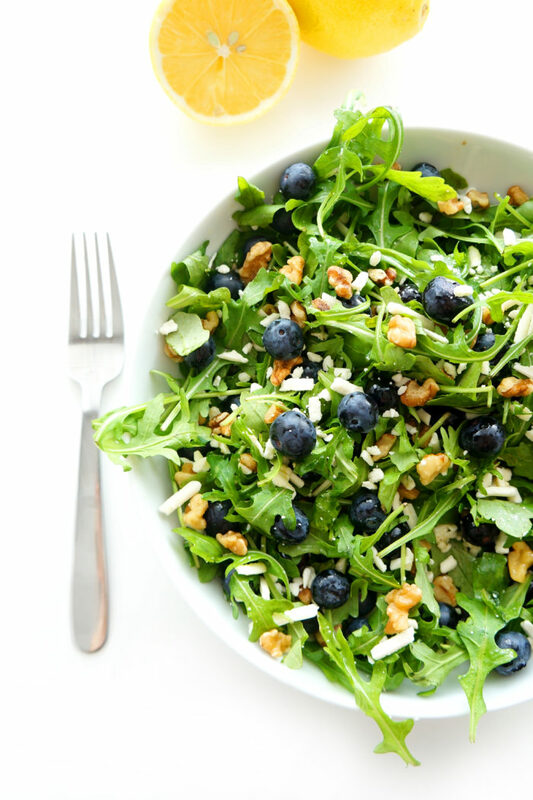 This blueberry walnut salad with lemon dressing is light, refreshing and a definite crowd-pleaser! Plus, it’s packed full of omega 3’s and antioxidants, which are great for the heart! The perfect salad for those warmer months! With the warmer weather this past week, I am seriously getting in the mood for all things Spring and Summer….including super refreshing salads! 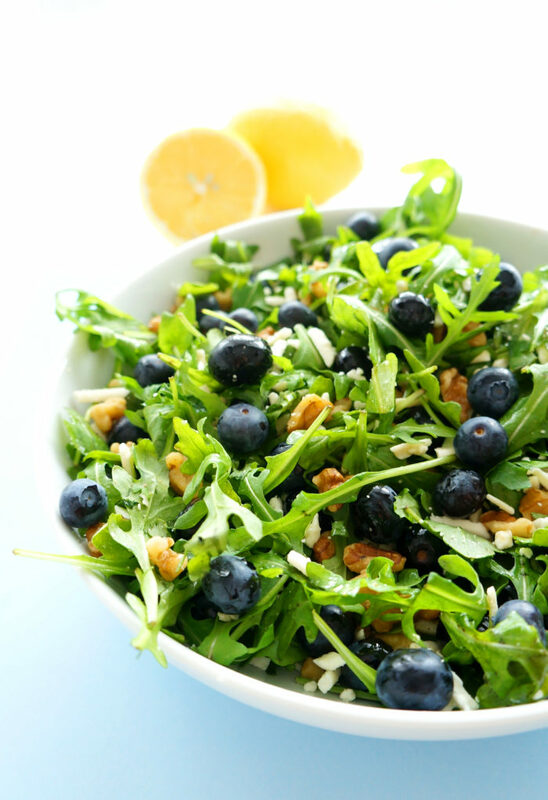 I’ve been experimenting quite a bit with salad recipes lately and my latest concoction is this blueberry walnut salad with a delicious lemon dressing. There’s something about lemon that just reminds me of Spring! I love this salad because it not only tastes AMAZING, but it also has less than 10 ingredients, so it literally takes less than 10 minutes to prepare. So simple, yet still so delicious. I served this salad up several weeks ago for some friends and it was a huge hit! It will definitely be going on repeat. Each mouthful is filled with juicy blueberries, crunchy walnuts and creamy feta all mixed in with a zesty lemony flavour. Yeah. My mouth is watering just thinking about it. AND to top it off, it’s also packed full of nutrients! Antioxidants, healthy fats, vitamin K and potassium! You could even add some chicken or salmon to it to further increase the protein and make it more of a complete meal. This, my friends, is what health in a bowl looks like! What’s your favourite salad to eat? 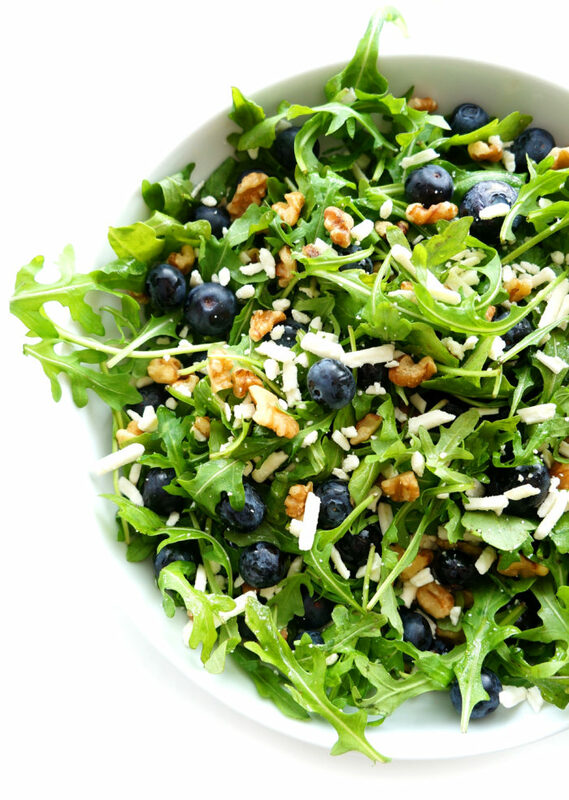 I love blueberries, especially when they’re in salads! So much colour and flavour in this salad! Thanks Abbey! Can’t go wrong with a salad involving blueberries! Legit the definition of SPRING right here! What a light and nourishing salad! Thank you Gigi! It’s SO refreshing! Blueberries, feta and walnuts? Yes please! One of my favourite combos for sure! Those colors are gorgeous! Perfect meal for the hot weather ahead! Yay for blueberries!! *-* This sounds so good! I love that it’s so quick to make and doesn’t require a ton of ingredients! Thanks Farrah! It’s super easy and delicious!